click here for full slide-show of 95 photos! 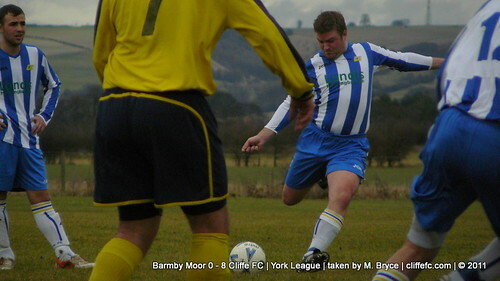 Cliffe FC’s moved into joint 2nd place as they outplayed bottom side Barmby Moor in a game that could of seen Cliffe run up a cricket score. At least 70% of the first half possession must of found itself at the feet of Cliffe FC left back Richard Gladwell as Barmby failed to react to amount of time and space he had. It took 10 minutes for Cliffe to open scoring as Shane Cawkill brilliantly brought the ball down to take on a defender and smash the ball into the net for a special goal, for both Cawkill and Cliffe to make it 1-0. The Jacksons up front for Cliffe (Alan and Chris) continued to be a threat and after a shot from Alan was parried, younger brother Chris was there to poke the rebound into the net for 2-0. The final goal of the first half came from the head of Alan Jackson from a Gladwell cross to make it 3-0 at the interval. Within two minutes of the restart it was 4-0 as Cliffe Man Of The Match, Will Ramsay, supplied Chris Jackson to grab his second from close range. Cliffe were guilty of wasting quite a few chances before Alan Jackson made it 5-0, grabbing his second also from close range. Manager, Keith Tiplady, was eager to make some changes with an hour gone and urged one of The Jacksons to get their hat-trick; a Richard Milner corner was met by the head of Alan to put Cliffe 6-0 up complete his hat-trick and then be substituted! Tom Hogg once again made an impression on the Cliffe opposition but so far a goal had eluded him until the 84th minute when one of his crosses from the right wing went straight in for 7-0 to the away side. Chris Jackson continued to look for his third but was continuously denied, his best effort lobbing the goalkeeper and hitting the crossbar. Cliffe’s eighth and final goal came from Tom Dunning, on his return after missing most of the season due to work commitments as he broke down the right wing to cut in a smash the ball into the net. With Elvington losing to Aviva 4-2, Cliffe FC effectively go joint 2nd place, laying 3rd by goal difference behind Elvington who also have 19 points having played two less games than Cliffe FC. F1 Racing FC top the table with 22 points. Next Saturday’s fixtures see Cliffe FC play host to Civil Service as Cliffe’s Reserves travel to face Civil’s Reserves.